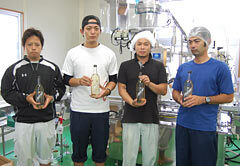 On November 18 at the Ie Island Distillery in front of Agarie, in Ie Village, Hisato Chinen (second from left) and his staff were thrilled to receive the double award. In the 2011 Okinawan Islands Fair held from November 25 at Okinawa Cellular Park Naha Ie Rum Santa Maria of the Ie Island Product Center (headed by village mayor Katsumasa Oshiro) was selected as a local product of superior quality. The rum also received the prefectural governor’s award, which is the highest award, at the 14th local product fair Arin-Kurin-Ichi held in October. The Ie Rum Café will be set up in the Ritou Shokudo (Island Restaurant) during the Okinawan Islands Fair, and tips will be given on how to enjoy the rum. On November 18 at the Ie Island Distillery, this year’s last filling work for the Gold aged rum in the oak casks was carried out. Filling of the crystal aged rum in the stainless steel tank has also already finished, and the supply of materials and preparation for distilling will begin next month. Although it continues to sell out or be in short supply both in stores and through the Internet, Ie Rum will appear in stores from the beginning of December making it easier to procure.